﻿ Can Warehouse Safety be Automated with Sensors? 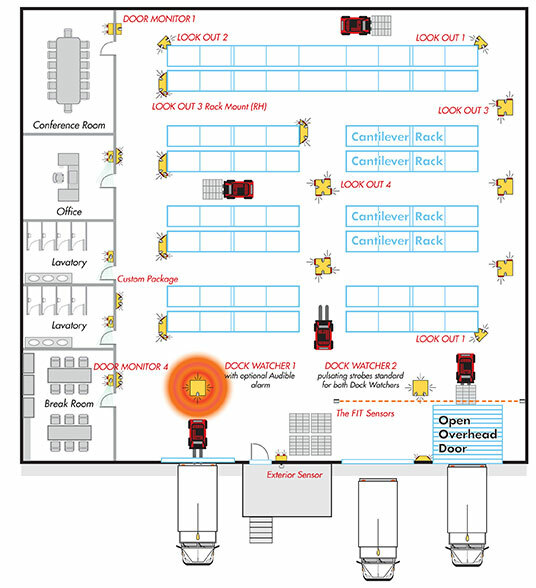 Blog Home > AisleCop > Can Warehouse Safety be Automated? OSHA estimates 85 deaths, 35,000 serious injuries, and another 62,000 non-serious injuries. More than 11% of forklifts are involved in these accidents every year, meaning that the forklift in your warehouse is statistically destined to have an accident before it goes out of service. The cherry on top of this awful pie? Almost 40% of those accidents, depending on whose numbers you follow, involve a pedestrian. And this doesn’t take into account the accidents that damage property, but don’t hurt people. Forklift-to-forklift collisions, or forklift colliding with warehouse racks aren’t included in these numbers if people aren’t injured. OSHA has placed an emphasis on reducing injuries related to forklifts, AGV’s, walkies, and other powered industrial trucks. They’re advocating training to help address what can only be called institutional ignorance of the handling characteristics, dangers, and poor processes regarding forklifts. It may not be enough. There are ways to help increase awareness of both drivers and pedestrians to the presence of forklifts. 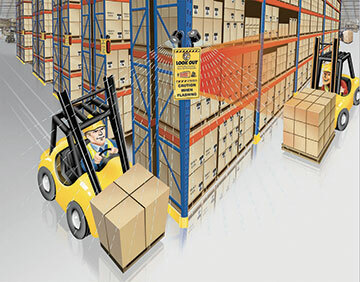 When it comes to busy intersections, rack aisles, warehouse entry points, blind corners, narrow intersections, ramps, workcells, and other areas where workers and forklifts mingle, it’s inexpensive to place warehouse safety sensors that can help alert both the driver and the pedestrian that the other is close. This type of automation doesn’t replace training; it augments it and becomes part of it. In the drawing above, you can see how these sensors can help in these “mingle” points. For offices, conference rooms, lavatories, and locker rooms, a simple door monitor sensor can alert the pedestrian that something is moving on the other side of the door. This is also good for overhead doors, where forklifts need to be aware that either a person or another vehicle is present on the other side. 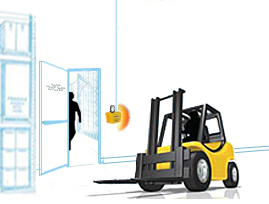 But for dock and shipping doors, another type of sensor may be useful — the dock area safety sensor. 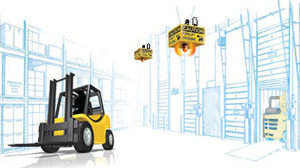 The idea here is that, since docks produce an outside number of injuries and accidents, a motion detector suspended above a dock door can warn a forklift driver who is unloading a truck that a pedestrian may be in the zone outside when he backs up into the warehouse. Conversely, it also alerts the pedestrians that a forklift is inside the trailer, and could re-enter the shipping/receiving area at any time. These sensors are hung from the ceiling and monitor the zone where forklift/pedestrian accidents are most common — the staging areas directly behind dock doors. They have visual alerts, with flashing red lights, with the option to add audible alerts as well. One of the more difficult areas in a typical warehousing operation to maintain safety is the rack aisle or storage area. This is an area where order pickers, re-stockers, or other warehouse employees must work on the ground with moving forklifts. The narrower the aisle, the worse the visibility, and the less reaction time for both parties. 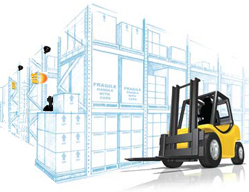 There are a number of warehouse collision sensors that can be placed as above, at corners where these kinds of accidents are more likely to occur. Again – these types of sensors cannot and should not replace training, traffic management planning, and good processes. When deployed correctly, they become part of that training, giving workers the best chance to avoid crippling accidents. There are certainly other methods less expensive, but less automated that can help improve this situation. Visibility mirrors are one way.